Welcome to the final installment in my four-part part series on making money on Modern cards in 2017. You can find the first part, covering the cards most likely to rebound from Modern Masters 2017, over here, the second part here, and the third part here. 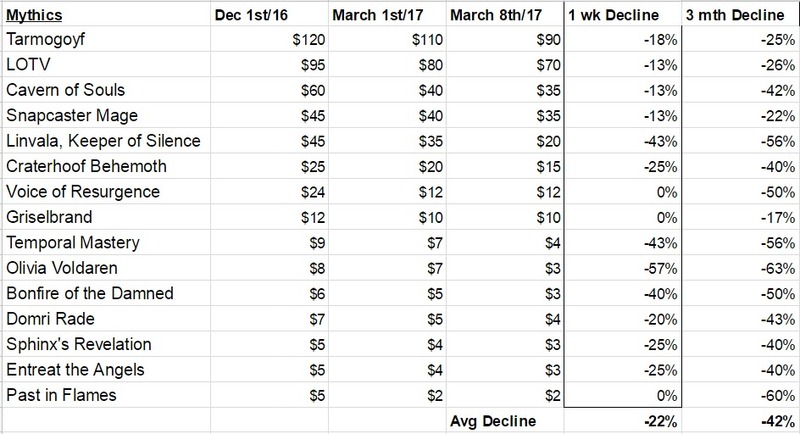 First off, let’s check in on the prices of the rares and mythics from Modern Masters 2017 to see how those potential specs are progressing. MM17 mythics have been sliding modestly in the last couple of weeks. Here we find ourselves just about on top of the Amonkhet pre-release weekend, and facing down additional MM17 supply that many vendors just received in a second wave. I suspect that much of that supply will be sold off as packs in the shops to maximize profits at this point, since the singles supply online is looking too deep to be very tempting. 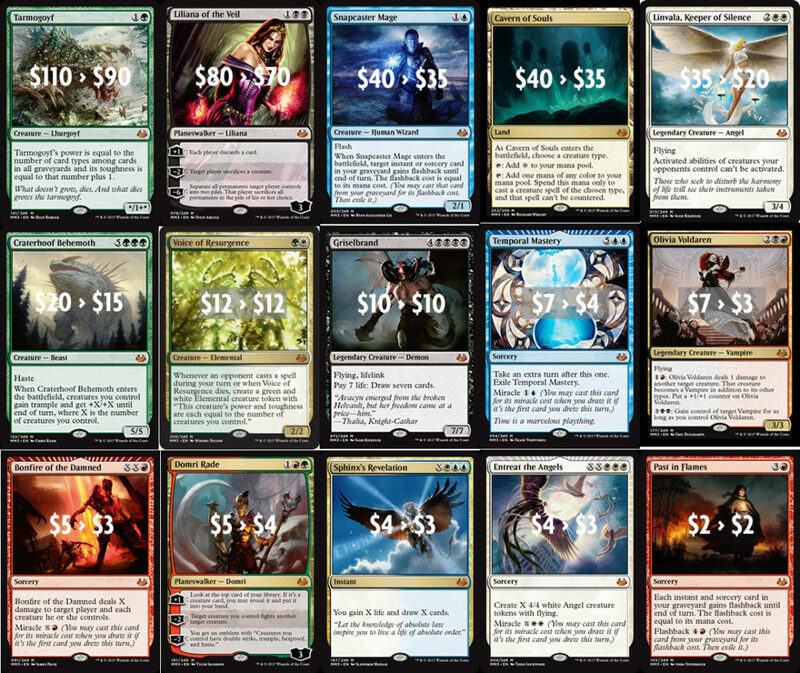 As a result, we’re looking at further price slides almost across the board on both MM17 mythics and rares. Pretty much all of the relevant mythics have lost ground over the last couple of weeks, including Tarmogoyf, LOTV, Snapcaster Mage, Linvala, Keeper of Silence, Craterhoof Behemoth, Voice of Resurgence and Griselbrand, with an average decline of -7%. 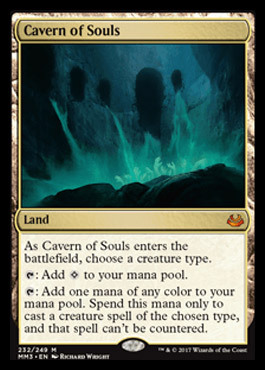 Cavern of Souls is the only important mythic to be holding steady in the $35-40 range. Overall, the MM17 mythics are down -52% since December 2016, -19% since release and -7%. As you can see, from my earlier list only Voice of Resurgence has really fallen far enough to prove my predictions true. The rest of the high demand mythics have been bleeding value lately, but are still showing enough strength to make these earlier targets look like a stretch. Only repeated supply is likely to get us close to these targets at this point, and with Iconic Masters having been announced officially today, a supply push for MM17 in the late fall now looks unlikely. That being the case, I think you can feel confidant buying in to the mythics you need anytime in the next month if you need them to play with. As far as speculation goes, I’m not going to be prioritizing these cards until I see the card supply dry up and I hear word that distributors aren’t sending out cases by the pallet any more. Now let’s take at where we’re at with the MM17 rares. Rares have also been sliding. Predictably, though the rares have also slid another -7% since early April, the group is down more than the mythics overall since both pre-order season (-26%) and last December (-66%). 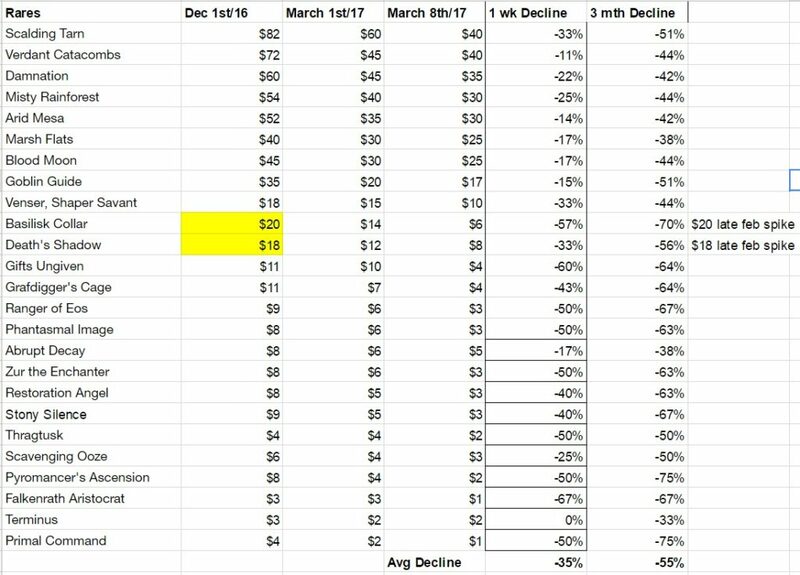 That 66% drop since last fall is especially egregious if you are a fully committed Modern play with a large collection and not much to gain from Modern Masters 2017 reprints. 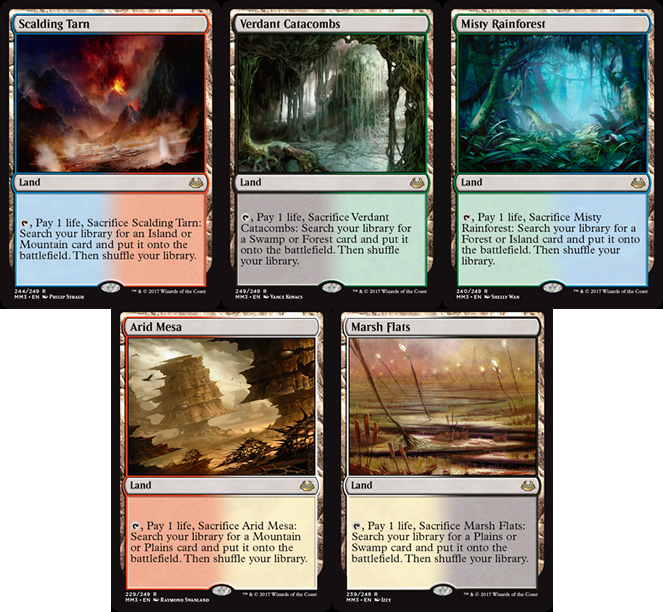 Looking at specifics, even the previously stalwart Zendikar fetchlands have fallen off their recover pace in the last few weeks, with losses around -6-7% for Scalding Tarn, Arid Mesa and Misty Rainforest, with neutral movement on Verdant Catacombs and a bit of a bump (4%) on Marsh Flats. There are over 120 listings on TCGPlayer.com alone for all of these lands so supply is still piling up bit by bit for now. That being said, there really aren’t that many copies left of Scalding Tarn below $50 at present, so there may not be much point in holding out for sub $40 pricing in the absence of a major supply side event. As with the best of the mythics, my targets were too optimistic for these high demand cards given how supply has played out so far. At this point I would be comfortable acquiring for personal use and Scalding Tarn, Verdant Catacombs and Misty Rainforest may yield reasonable gains over a horizon of 6-18 months pending any further supply side shocks. As I stated with the mythics, keep an eye on the total supply to decide whether to prioritize going deep. Poking around on Twitter, Facebook and various finance message boards may yield another 10-15% savings on your targets, so make sure to dig for your dollars. We did better overall with the rest of the rare predictions. People told me I was nuts for calling the previously $60 Damnation to fall under $25, but here we are with it at $17. The reality is that this card’s demand was more urban myth than it was fact, and supply is currently still piling up. I want a couple of these for casual decks and cube, but I’m in no rush until I see a deal at $15/copy. 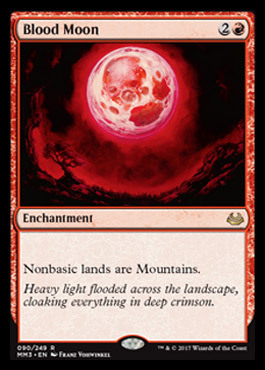 Likewise, Blood Moon has fallen hard from $45 and doesn’t seem likely to recover any time soon given the number of listings out there. This card is on my list of “cards they might get rid of at some point in Modern” so I can’t see myself being inclined to go deep on it no matter how low it goes. Goblin Guide has been bleeding out steadily since December, and may well get to my target. Either way, you’re already set up for a $100 discount per play set, so no definite reason to be shy if you need them now. I didn’t comment on the likely price of Death’s Shadow up front, but so long as that deck doesn’t get banned out of Tier 1 status, picking these up at current prices ($7/$15 foil) seems like the most obvious place to start speculating on the reprints, though inventory isn’t low enough, even on this obvious staple, to make it a priority target. Last week we took our second look at the cards that dodged a reprint in Modern Masters 2017. This week we’ll move on to looking at some of the cards that have just recently been printed or been making fresh waves in the format to figure out if there is any meat left on that bone. Collective Brutality was largely underestimated when it debuted in Eldritch Moon in the summer of 2016. 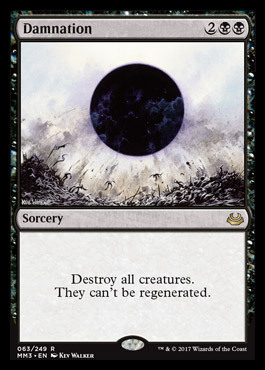 Even before Fatal Push set a new standard for black removal in Modern and Legacy, Collective Brutality was assumed to be too slow as a two-mana sorcery to see serious play. The mistake made by the detractors however, was almost certainly the flexibility provided by this powerful card. Depending on your immediate needs, Collective Brutality can get rid of a key combo piece, removal spell or sweeper, kill a creature, or help win a race with a significant life swing. The ability to use multiple modes via discard, both turns on madness and serves up a bonus to decks that want various card types in the graveyard anyway. The most recent Jund Death’s Shadow builds are a great example of a prominent deck that puts the card to good use, as do Dredge, Abzan and Grixis Death’s Shadow. Each of these decks tends to run a max of one copy in the main, with another 1-3 copies in the sideboard. 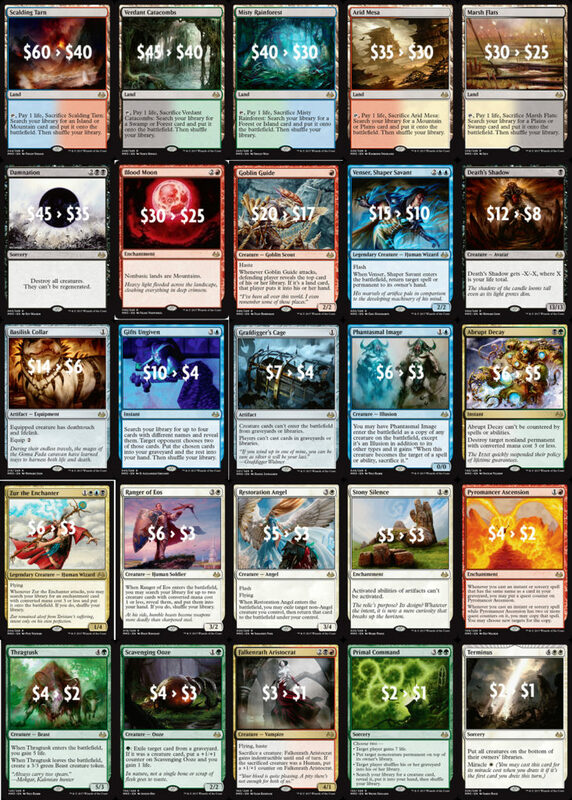 In Legacy, B/R Reanimator runs 2-3 copies in the sideboard, and 4C Loam sometimes runs it as well. Last August you could have had your fill of this emerging staple at $2, but now it’s hovering between $9-10. Most of the play isn’t in Standard, so this card could hold it’s elevated price tag (relative to other Standard rares) despite rotating in the fall. I was in on foils early at $6 or so, and recently sold out closer to $20 based on my “greed limit” rules. 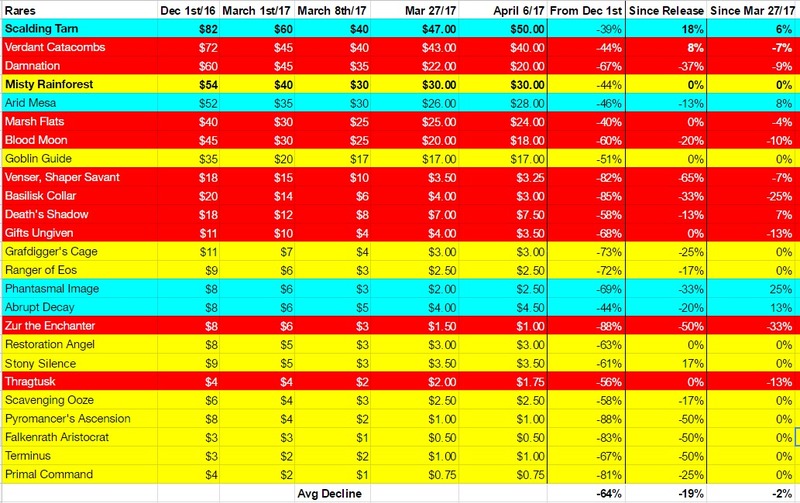 It’s possible that foils near $20 are still a buy however as total inventory is very limited and the card could easily hit $30+ this year if demand is persistent. Being from a small summer set lessens overall inventory here, so performing better than say, Collected Company foils, might be reasonable. Thought-Knot Seer & Reality Smasher already occupy dual positions in the Top 10 creatures in the format by play volume and they are almost always played as 4-ofs. These two bad boys never see any play on any team but Team Eldrazi, but given that there are several possible flavors of Eldrazi in Modern, and that these cards see play all the way back to Vintage, we should at least feel them out. Another point in their favor is that Oath of the Gatewatch was a winter set rather than a fall set, meaning that there is significantly less of these around than say Smuggler’s Copter. During Eldrazi Winter (Feb/March 2016), when Eldrazi decks were temporarily ruining Modern, TKS got up over $15, but has since fallen back into the $5-7 range. Given that Thought-Knot Seer currently boasts about the same number of total listings online as Death’s Shadow, despite coming from a set with wider distribution, it would seem like a relatively safe value store for next couple of years. Reality Smasher only got up to $10 or so last year, and is currently available closer to $3, so it may represent the better deal here since both cards see roughly equivalent play. Matter Reshaper is also a constant presence in the Eldrazi lists, and at $2 it’s fairly attractive. Endbringer is a typical three-of in the Eldrazi Tron lists, and it’s just $.50, partially due to the presence of widely distributed promo card and partially because this card wasn’t caught up in the original hype last year. Mostly through play in Eldrazi Tron as a four-of, this multi-format all-star from Aether Revolt was underestimated early, but quickly turned heads in multiple formats. Paper copies spiked closer to $15 near the Pro Tour, but have since fallen closer to $10 as Standard interest has waned this winter. As a powerful colorless creature with a flexible casting cost, a built in mana sink and a number of interesting artifact and +1/+1 counter synergies, I definitely have interest in investing in the card long term, but I’d like to see what happens with the upcoming Standard list before I consider a move. Ideally, I think I want to look at the non-foils under $5, which likely means waiting until the 2019 fall rotation, but foils are already nearly dry under $20, and could easily hit $30, so I’d likely start with those now. I recently bought a few Russian pack foils for less than $50, and I expect those will be a really nice feature in my portfolio in a couple of years. Early in the summer of 2016, when Shadows Over Innistrad was nearing peak supply, you had a shot at Traverse the Ulvenwald close to $2. Fast forward a year and the card has posted up in the paint as part of the best brew in the format, Jund Death’s Shadow, where it is played constantly as a four-of in a deck that has no trouble at all hitting Delirium and turning this into a virtual Demonic Tutor. Consequently you’ll need to cough up $7 or so to get your hands on some, and I think you can safely pass on that if you missed out on the lower price tag. The foils are another matter entirely, as there are very few available, and the different between the sub-$10 copies around and the $20 asking price on the 30th or 40th copies will not be a tough bridge to cross assuming that Death’s Shadow stays near the top of the metagame. The foil multiplier is also inexplicably low, especially for a set with no Masterpieces to hold back it’s price recovery down the road. Furthermore, even the death of Death’s Shadow aggro might not be enough to hold this card down long term, since the power level and casting cost are in the sweet spot that tends to get used in multiple shells over a long enough time horizon. I’ve been a pretty active buyer of foils near $10 over the last few months and I’m not done yet. In terms of solid specs, this is about as good as they come. There’s little doubt that this card represents the most important new kill spell in any format in recent memory. The problem, from a financial perspective at least, is that everyone was fully aware from the start and the card is an uncommon. Despite that lowly rarity, foils are hovering in the $30-35 range and the inventory is not particularly deep even at that price. Aether Revolt will still be opened to some degree for the rest of the year, but we are almost certainly facing peak supply already or pretty close to it. Could this be a future $50 foil uncommon? I think it might get there, but I don’t like the buy in prices as they stand so I think I’ll pass on this one in favor of more likely success. 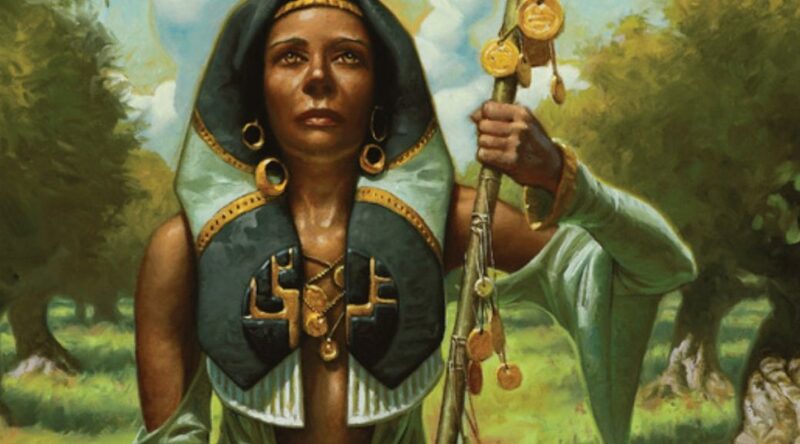 Join me next week when we dig deep into the Amonkhet opportunities in a new Digging for Dollars! 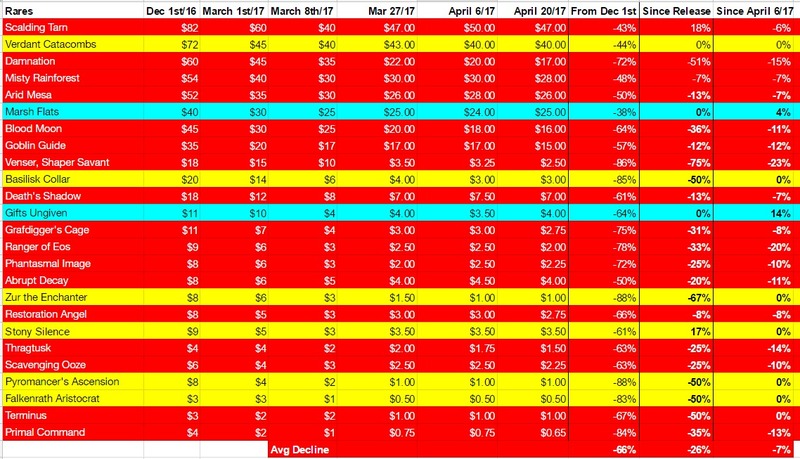 This is the third in my (now) four-part part series on making money on Modern cards in 2017. You can find the first part, covering the cards most likely to rebound from Modern Masters 2017, over here, and the second part here. As predicted, the shift in focus to Amonkhet and the continued availability of supply has lead to even the mythics that were rebounding demonstrating contractions since we last checked in. Tarmogoyf, LOTV, Cavern of Souls, Voice of Resurgence and Griselbrand have all fallen further and the mythics are, on the whole, down 15% since release. 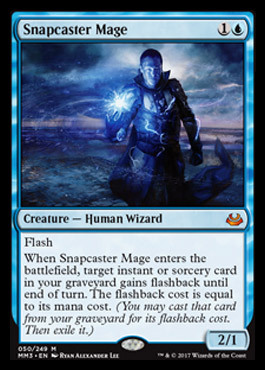 Even Snapcaster Mage is holding steady now in the low 40s. Same logic applies as before here: you can feel free to buy the highest demand cards at these levels, but there is no real rush on the rest and you can judge your entry point when you start to either a) see supply draining out or b) catch wind of additional supply entering the market. MM17 rares have been following similar patterns, and they’re down an additional 2% in the last couple of weeks. Scalding Tarn, Arid Mesa, Phantasmal Image and Abrupt Decay are showing shallow gains with the rest of the rares either holding steady or falling off further. Most of the fetches, Blood Moon, Goblin Guide, Death’s Shadow (which is up despite my red coloring in the chat above) and Damnation all seem fine here if you need them, and otherwise you choose your entry point as with the mythics. Last week we took a look at some of the format staples that were not reprinted in Modern Masters 2017 that are likely to show gains, or have already shown gains. Let’s polish off that list before we move on to newer cards that may yield further gains next week. Dark Confidant was nearly one of my picks on MTGFastFinance a couple of weeks ago, as a perennial staple that got printed twice in Modern Masters (2013) and again in Modern Masters 2015 but not in MM17. Since the release of the new set in mid-March, this Jund staple has moved up $10 from $38 to $48 or so, but there are still copies out there closer to $42 and those seem like a solid pickup. I would expect Dark Confidant will hit $60-$70 before it sees another reprint as NM inventory across the three printings is relatively low for a Top 40 creature in Modern. Not a huge home run, but a solid hold that you can play with while it gains value. 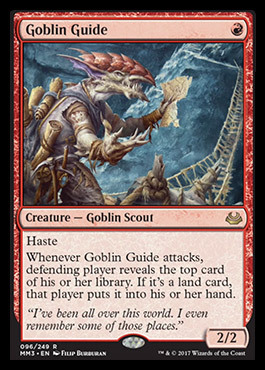 This card is one of the most efficient card selection spells in Modern, so long as you’re on the hunt for a specific colorless card. Between Bant Eldrazi and various Tron builds there is plenty of Tier 1 demand for full playsets, and Lantern Control also runs the card. I called this on MTGFastFinance to move from $5 to $10 this year when it wasn’t reprinted in MM17, and it briefly spiked, but as a common vendors managed to restock fairly easily, and we’re back to the previous $5-6 plateau for now with a 150+ copies in stock on TCG. That could take a while to drain, but if you felt like going deep because of the demand profile, you could make a dent. We’re unlikely to see a reprint until 2019 so the odds are solid we hit my target sooner or later. Mox Opal is a central card in Affinity decks in Modern and has been for years. It also sees lesser play in Lantern Control and Puresteel Paladin builds, and most recently as a four-of in the new Scrap Trawler/Krark-Clan Ironworks combo decks. Since January Opal has moved from $40 into the $55-$60 range and the printing of the Masterpiece version in Kaladesh means it’s pretty unlikely we see this again until 2019. There is also the outside chance of a potential banning in Modern as a card that enables unreasonable mana acceleration, but I suspect there are higher priority targets this year. All of that being the case, despite the odds that you could squeeze another $5-15 from this stone, I will be staying away from regular copies. On the other hand Masterpiece copies are still available from some sources in the $90-100 range and I suspect that they will end up over $150 within the next 18 months so long as the card dodges the slight ban potential, as the inventory is already fairly low. I’ve picked up a few on that premise. Aether Vial is consistently a four-of in Merfolk decks in Modern and Merfolk has been putting up reasonable numbers for a couple of years now despite many players looking down their nose at the deck. The card also shows up in Eldrazi Death & Taxes (my current deck) and GW Hate Bears, and it’s a four-of in those modestly played decks as well. Despite that, it’s barely a Top 100 card in the format, though it does boast some additional demand from Legacy Death & Taxes. This card is up a couple of bucks since the MM17 list was revealed, but inventory is not under much pressure, so it may be that Aether Vial needs another prominent home to drive the price towards $60 before a likely reprint in 2019. I’m not in a rush to get in on this action, but the Masterpiece versions around $90 are a bit more tempting, since they are likely to drain in fours (as opposed to something like Sol Ring) and should end up over $130 down the road. 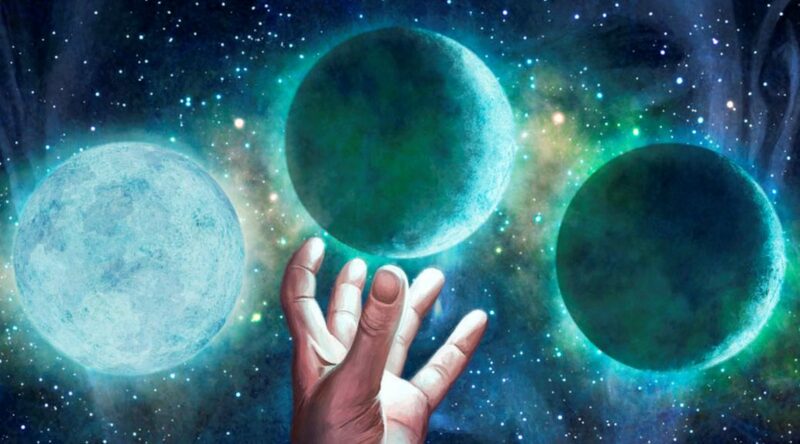 Crucible of Worlds has been experiencing an upswing in play in Modern lately with many decks looking to generate value engines using Ghost Quarter to keep Tron lands and creature lands in check. Eldrazi Tron sometimes runs it main, or has a single copy in the sideboard. GW Value with Renegard Rallier, U/W Control and Lantern Control also make use of it, but not in much greater quantity. As such, most of the $60 price tag is being propped up by the fact that we haven’t seen a regular printing yet of this card in any of the Modern Masters sets. It was a Fifth Dawn rare, reprinted in 10th edition, and the Masterpiece in Kaladesh was the first new printing in years. The regular copies could edge up higher between now and Modern Masters 2019, where it is a likely inclusion, but it could also show up randomly in some other supplemental product in advance and the demand profile is too shallow to get me excited. The Masterpieces in the $90-$100 range are a good bet to beat $130 at some point, which is a solid return, and inventory is already low so if you like this, maybe you’d be better off looking at that version. If you’re looking for a low value target with solid upside, you could do worse than this automatic four-of mythic rare that has earned a permanent slot in the Merfolk decks. Supply is still pretty deep because this was a fall set mythic, so there isn’t any rush here, but we’re not likely to see this again for a while. No deck but Merfolk wants it, but you only really need 50-100 new Merfolk players over the next year or two and some speculator activity to push this into the $6-10 range. There’s also the fact that the fall set this year, Azatlan, seems to carry a strong merfolk theme, which one would imagine might give this deck a boost. This is a $50 uncommon featured in a deck that many see as too powerful to be allowed to be left unscathed by the ban hammer. Either a reprint kills this, or a banning does, because I can’t see this card surviving as a spec long enough to show worthwhile gains from this point on. If you had these sitting around and sold already, they likely paid for your Coldsnap boxes back in the day but I don’t want to be holding or acquiring a card this dangerous right now. Move along. This is an odd card to be at $50 given that it doesn’t even crack the Top 100 most played cards in Modern. When it is played it’s usually in Grixis or U/W Control shells, but those decks haven’t been at the top of the metagame for years, and blue decks in general feel like they need a bit of help to break through. Sentiment seems to be warming to reintroducing Jace, the Mind Sculptor to the format, but that could easily fail to materialize. 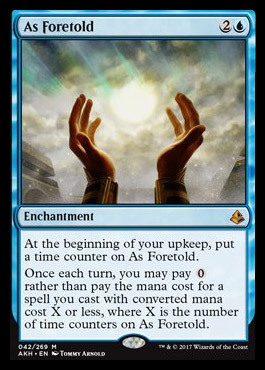 Then of course, As Foretold was revealed this week and brewers start wondering if casting this immediately off that slow (yet powerful) enchantment might be enough to kick of a dazzling display of control. All that aside, this is another price tag that is mostly propped up by limited supply, and only the suspend mechanic really holds it back from popping up randomly in a product release. That being said, supply is shallow enough that there is a chance the card could hit $70-80 on increased play, so your decision to move in is really a bet on success before a reprint. Join me next week when we look at some of the up and comers in Modern that might make us some money if they can break through to the top ranks. This is the second in my three part series on making money on Modern cards in 2017. You can find the first part, covering the cards most likely to rebound from Modern Masters 2017, over here. Most mythics are still on the decline since the release of MM17. 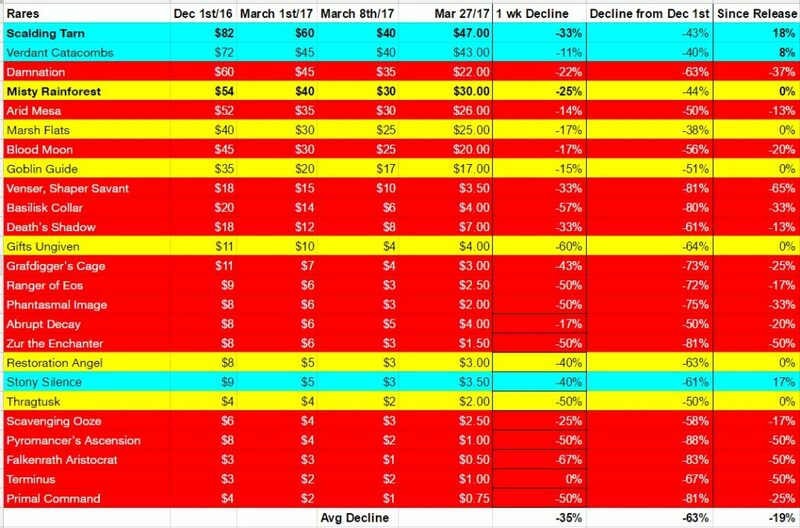 Nearly all of the MM17 mythics are either holding steady or have continued to fall, down an average of 12% from their release day pricing. Some very good deals were found during opening weekend, and momentum from those couple of days likely accounts for the few rebounds. The exceptions along those lines so far are Liliana of the Veil, Cavern of Souls and Snapcaster Mage, all of which are of course very popular staples in both Modern and Legacy. LOTV currently holds one of the shallowest listings on TCGPlayer.com, which could indicate it could regain $90-100 within the next few months, pending information on further set inventory. 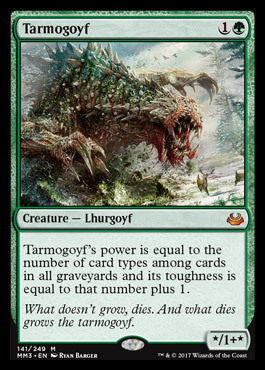 Tarmogoyf has also been relatively consistent in the $85-90 range. As frequent 3 or 4-ofs in multiple decks, many players have had their eye on these cards looking for a solid entry point, and were likely impressed enough by the large discounts vs. prices from last fall to move in. It’s possible that some dealers and speculators have also taken up some of the inventory slack in hopes of future profits. From here on out, I would expect the cards that have been holding stead or rebounding to continue along similar lines, but whether this stays the case will depend heavily on how much more inventory shows up. Now that we’ve moved on to Amonkhet spoilers, the shift in focus back to Standard may redirect player funds and chill the rebounds as well. That being said, there really aren’t that many listings for the mythics at present, so if inventory is choked off faster than expected, further gains on the popular cards are likely. Rares also continue to fall. MM17 rares have been following similar patterns, with the average rare down a whopping 63% since Dec 1st/16, and nearly 19% since release day. If we ignore the most popular handful of rares, many of the other rares are down over 80% (!) since December. Some of these cards are now so cheap that waiting for further discounts is largely unnecessary. If you need play sets of Terminus, Pyromancer’s Ascension, Thragtusk, Scavenging Ooze, Phantasmal Image, or Abrupt Decay a further 10-20% decline won’t make much difference either way. The most resiliant rares have so far proven to be Scalding Tarn, Verdant Catacombs and Stony Silence. Most of the other fetchlands are so far holding steady, with shallow gains or losses, but I don’t think you need to be shy on getting in on them at this point, at least for your first playset. I’d like to spec on some of these, but for those purposes I’m willing to hold off until I understand inventory flow a bit better. Death’s Shadow got as low as $4 at one point during release weekend, but as one of the most important creatures in Modern right now, it didn’t take much for people to scoop them up and push the price back towards $8. If the card stays popular, and doesn’t get banned out of the format this year, these could end up close to $15 and may still be a solid speculative pick. Cards like Damnation and Basilisk Collar, whose prices were largely supply side driven, have taken a serious pounding, with $20 Damnations now available, representing a 67% discount vs. last fall. Now let us turn our attention to the important Modern cards that didn’t make it into Modern Masters 2017, investigate their recent price trends and try to identify our best targets for further gains. Noble Hierarch is one of the top ten cards in Modern by play pattern, and as a staple in Abzan, Bant Compay, Bant Eldrazi, Infect and Bant Spirits we have every reason to believe it will continue to occupy that position. I wouldn’t hold your breath for a better mana creature either as Hierarch already pushes the envelope pretty hard. This card peaked near $80 last fall, only to fall to $60 on reprint fears. Now that we know it isn’t likely to be reprinted this year (other than potentially as a Masterpiece) it has regained a few dollars and could easily top $80 again before a near certain reprint by Modern Masters 2019. This isn’t a card that is going to demonstrate fantastic % gains, but it is a consistent staple that could earn you $40/playset after fees before the end of the year, so there’s relatively little risk on getting in on a set to play with or speculate on. Karn Liberated doesn’t even crack the top 50 cards in Modern, but it is a fixture in both Eldrazi Tron and GW/GB Tron Variants, where they run anywhere between two and four copies, depending on the build. The card is also iconic and splashy enough to enjoy solid casual demand, but it has already popped from $45 to $65 on the news that it wasn’t included in MM2017 so it’s not clear how much meat is on the bone. If the Tron lands ever get from Modern, this card withers instantly, and that’s not an impossible scenario. There may be a few more dollars to be made here, but I think I’ll steer clear and focus on higher yields. Doubling Season is distinctly not a Modern card, but it was last printed in a Modern Masters set (2015) so it was fair game to see a reprint this winter on the strength of it’s EDH/casual play and it’s steady price gains since the last reprinting. At this time last year Doubling Season was a $40 card that used to be $15 back in 2014. Now it retails consistently around $60 as a staple in Atraxa, Ghave, Rhys and Marath decks in Commander, including over 8300 lists found on EDHRec.com. That’s a strong demand profile, and the inventory is relatively shallow no matter where you look. These are all conditions for further gains, but I’d guess that $80 might be the max for this one before it gets nailed by a reprint, which could come as soon as Commander 2017 next fall. If you can glean some copies closer to $50 and aim to exit near $70, you might be ok, but you’re tying up just as much capital as with Noble Hierarch hoping that demand keeps pushing it up the curve. 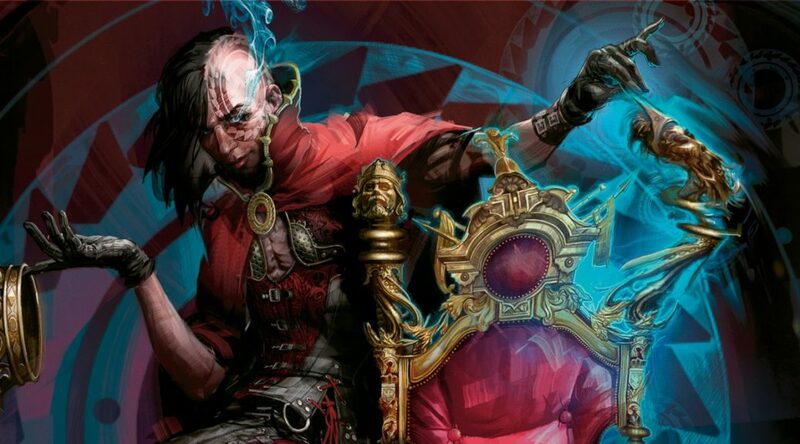 Fulminator Mage is an increasingly useful card in a meta where Tron lands and ambitious mana bases abound, hence why we see it in lists from Death’s Shadow Aggro to Grixis Delver and Jund. Last seen in Modern Masters 2015, the land hating shaman didn’t make the cut this time around, popping from $20 to $30 on the news. There are now very few copies out there under $40 and this looks like a solid option on the premise that it is a Top 10 card in the format and could breach $50 before seeing a reprint or an unlikely replacement (since WoTC rarely makes new land destruction cards with Modern playable casting costs). Getting in close to $40 will likely pay off. Chalice of the Void is another Top 50 Modern staple that we got in an earlier Modern Masters (2013), but not since, though in this case a Masterpiece edition was printed in Aether Revolt. The value of this artifact floats relative to how good shutting down one drops is and whether mid-range and control decks can work around that stipulation in their own lists. The card most often shows up in Eldrazi Tron, Valukut Breach or W/R Prison as of late, Chalice enjoys the added benefit of being playable in both Legacy and Vintage. Chalice of the Void was already at $45 heading into MM17, and has since popped to $65 or so, with very shallow inventory under $80. I can’t see another reprint any time soon, so I think $80 is a definite possibility, which could be worth $40 a set on a $260 investment. That’s not amazing, and Noble Hiearch’s strong overall demand profile may mark that as the superior play of the two. If you’re already holding, there’s no rush to unload, so check back in a few months. Living End is worth noting because as of today we now know that Amonkhet is bringing back cycling as a mechanic. 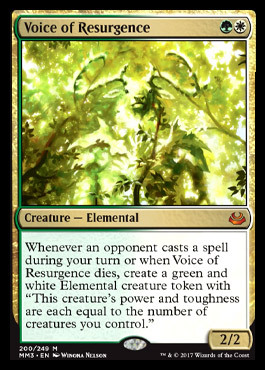 This means that we may be about to get a bunch of creatures with cycling that could add some power to Living End. Early speculation on that basis has already pushed this card from $8 to $12 today and inventory is now low enough everywhere that the price could settle anywhere between $10 and $20, depending on whether a stronger version of the deck emerges or not. Now on the one hand, this card has only ever seen a single printing and that was over a decade ago. Because Living End has the Suspend mechanic, it can’t just be thrown into any old product release, but on the other hand it doesn’t feature any specific narrative cues that prevent it from being included alongside a return to suspend as a mechanic. 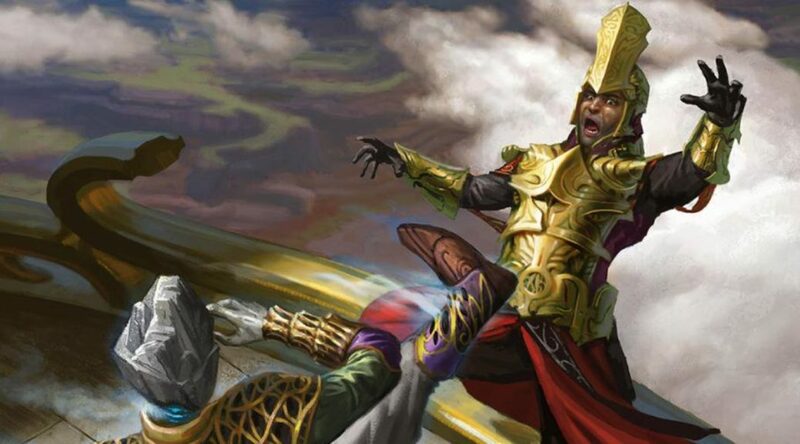 There is also the possibility that Living End decks suffer from too much incidental graveyard hate in Modern overall, and just aren’t positioned well to gain fresh traction. There are still some scant few copies floating around at $10 or less, and under $12 I’m be fine picking up a few playsets to roll the dice. Eldrazi decks in various flavors are putting up solid numbers in Modern, largely because they get access to this clearly overpowered land. You would think that as an uncommon that has seen multiple printings in the last few years, this would be a card that was resistent to strong growth, but we’ve already seen this Top 15 land in the format go from $2 to $10 during Eldrazi Winter (2016) only to fall back to $5, and then hit $12 just recently on renewed use in Eldrazi Tron lists. At this point inventory is shallow enough that I’ve moved in on several fresh play sets aiming for a $20 exit. Within the year I think we’ll get it. Ok, so we’ve covered a lot of ground but I’ve got at least ten more cards I think we need to discuss. Join me next week when we pick up this thread and continue exploring ways to make money on Modern this year.